My Little Pony is series of toys that were originally released back in the 1980’s, the line went through several cycles of being discontinued due to low sales and then revived at a later date due to a resurgence in popularity. Since 2003 the line has been back in popularity, with a fourth incarnation released in 2010 alongside the animated series My Little Pony: Friendship is Magic. 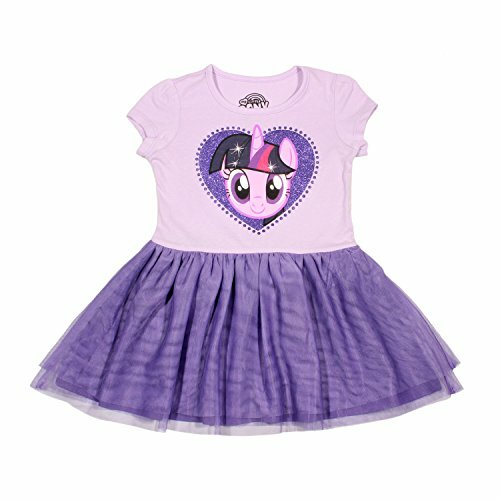 Twilight Sparkle is a character from My Little Pony who is introduced to us as someone who is anti-social and prefers to read books, later on we see her personality develop although she retains her logical edge. 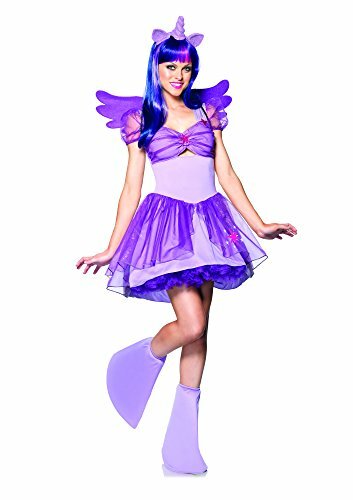 In today’s post we’ll be showing you how to put together a My Little Pony Twilight Sparkle Costume, perfect for cosplay or fancy dress. With everything you need including wig, unicorn horns, cosplay outfit, wings and makeup. 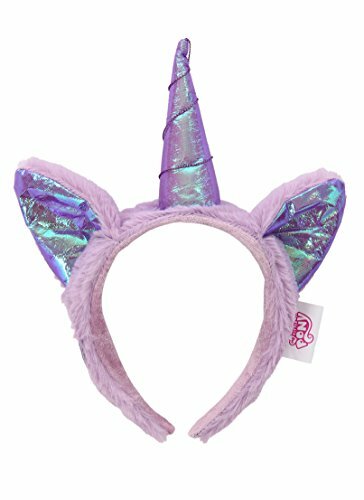 The first item you’ll need is a pair of unicorn horns, here is an option that will work well for this character. 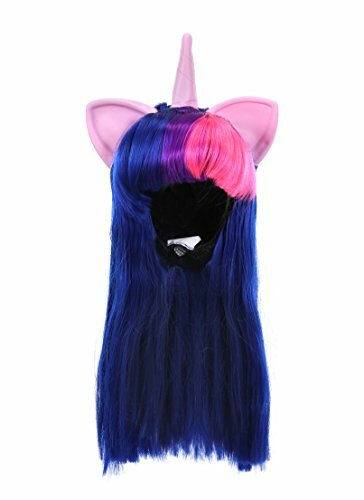 You could also wear a wig in the colors of Twilight Sparkle although I have seen people cosplay without one. You could also dye your hair dark blue or use spray in dye for a less permanent change. After you have a wig in place let’s move onto the outfit itself. Here are costumes for girls who want to dress up around he house aswell as go to fancy dress and Halloween parties. 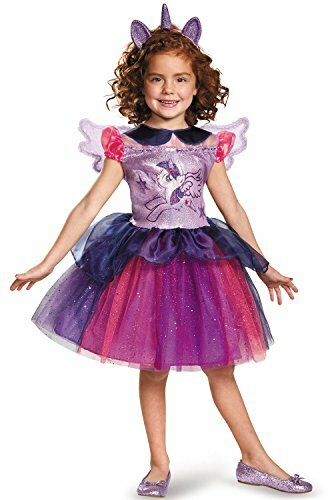 A unicorn multicolored tutu with dress. Just add a pair of sparkly dress up shoes and you’re child is ready to go. 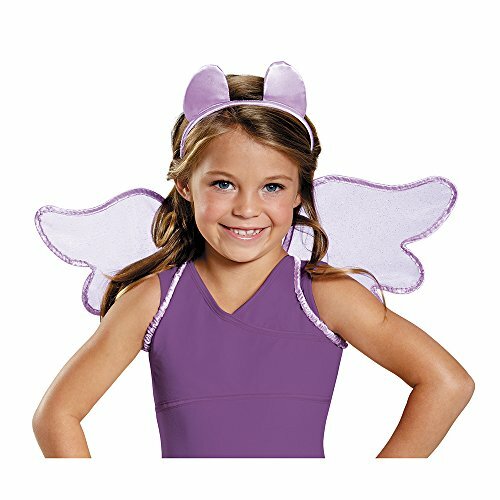 It’s not just children who can dress up as Twilight Sparkle from My Little Pony, fans of all ages can go as her. This would be ideal for those wishing to co-ordinate outfits as a family. 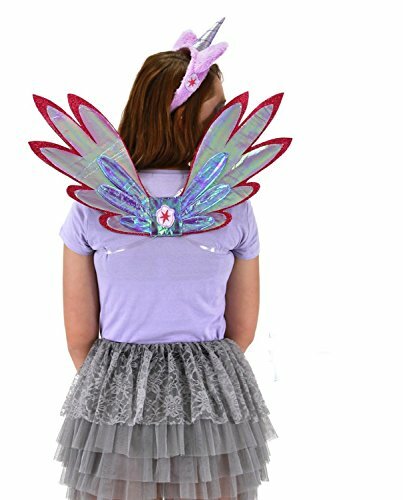 Here are two options for you to chose from, from both Amazon and HalloweenCostumes.com. Just in case one goes out of stock during the busy Halloween shopping season you’ll always have a back up. Then you can add some wings to the costume to represent the character better. Here are two choices to pick from that will work well. Add purple face paint to complete the look. Or check out this four minute video tutorial to add extra detail. Start with a white base of body paint, mix with purple until you get even coverage. Go in with blueish purple eye shadow on your lids, add silver glitter to your crease using glitter gel. Finish off your eyes with an application of mascara. Draw over your natural eyebrows with dark purple face paint. Then line the lips with a pinkish purple liner and fill in with pinkish purple lipstick. Finally draw on her ‘cutie mark’ with white and pink face paint using a clear reference image as a guide. Be sure to check out our other tutorials on the blog before you leave and follow us on social media for updates when we publish new posts.